Imagine you have a machine with 1-4 GPUs and you want to use all of its for training but you still want to see the evaluation results. 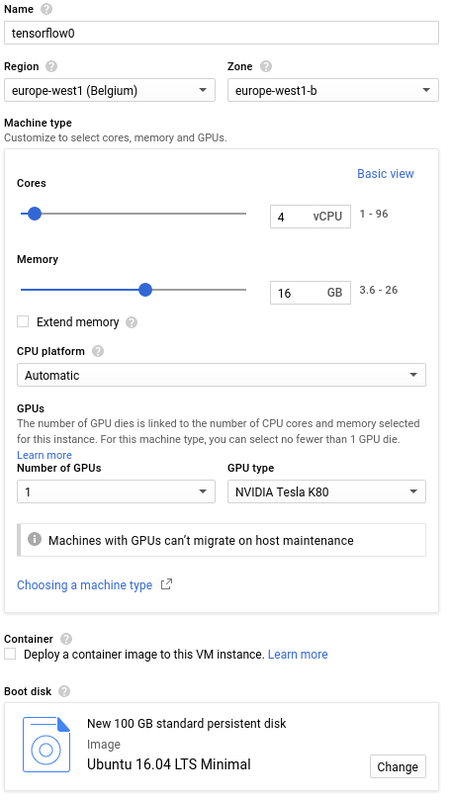 If you don’t want to run the evaluation job on CPU only, you can run the evaluation on other GPU enabled host. 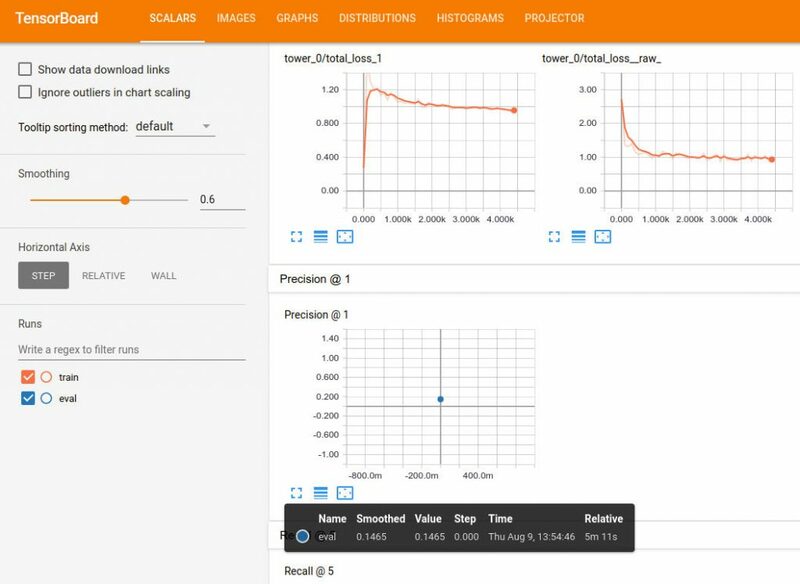 We will use a simple configuration where we have 3 servers with Tensorflow installed: model training, evaluation and Tensorboard graph visualization tool. We assume training and evaluation hosts have one or more GPUs. It is recommended configuration since GPUs speed up deep neural networks training process many times. The third machine is used only for visualization of training/evaluation process. It runs tensorboard which is reading logs from a specified directory. 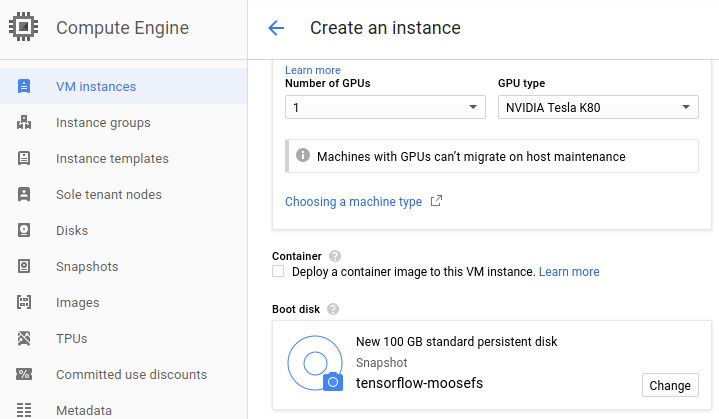 Of course, you can install Tensorflow on chunkservers or install MooseFS Chunkserver in your Tensorflow GPU-enabled host. 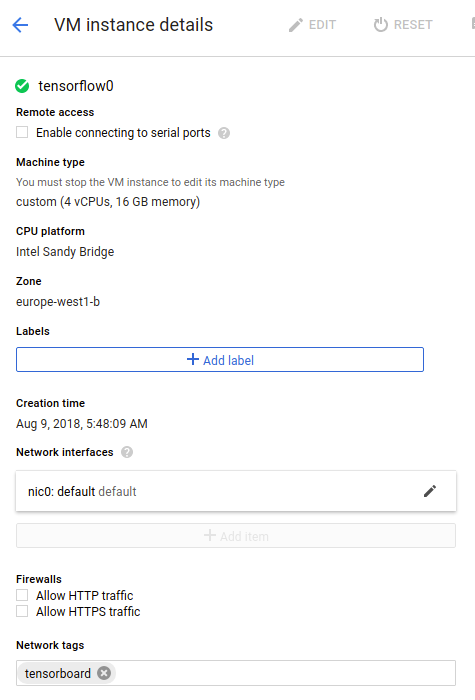 For the purpose of this experiment, we will use the MooseFS cluster deployed on machines in Google Cloud. 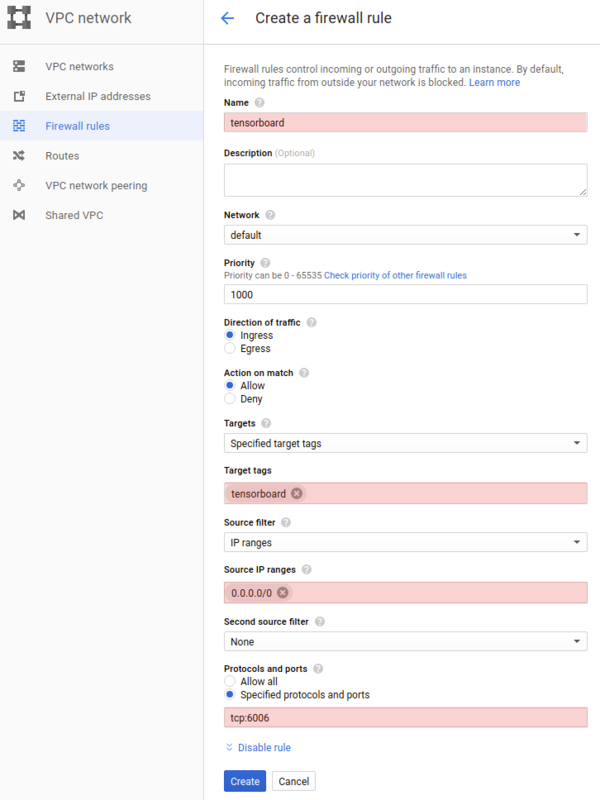 If you don’t have your cluster ready, go to this post How to quickly set up the MooseFS cluster in Google Cloud. If you want to check the throughput of your network, go here. In this case, we consider training Tensorflow models on separate machines. We assume operating systems are installed on new hosts, and hosts are in the same local network. 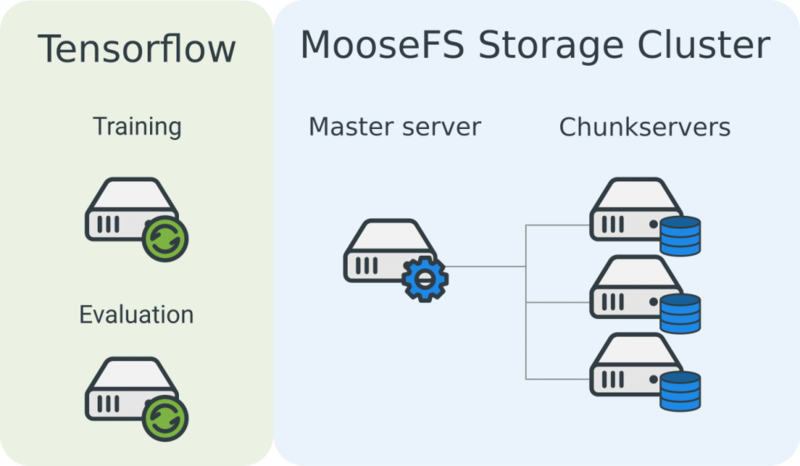 Tensorflow machines have MooseFS Clients connected to the MooseFS Storage Cluster. We will set up two identical machines for Tensorflow with 4 CPU cores, 16GB of RAM and one GPU – Tesla K80. Machines will be using standard 100GB hard drives. The configuration is presented on a screenshot below. We will create one and install Tensorflow and MooseFS and we will copy it afterward. Machines with GPUs cost more! Check the pricing or go to the Pricing Calculator to estimate costs. You can’t create GPU enabled machines using free trial money, you will be charged. 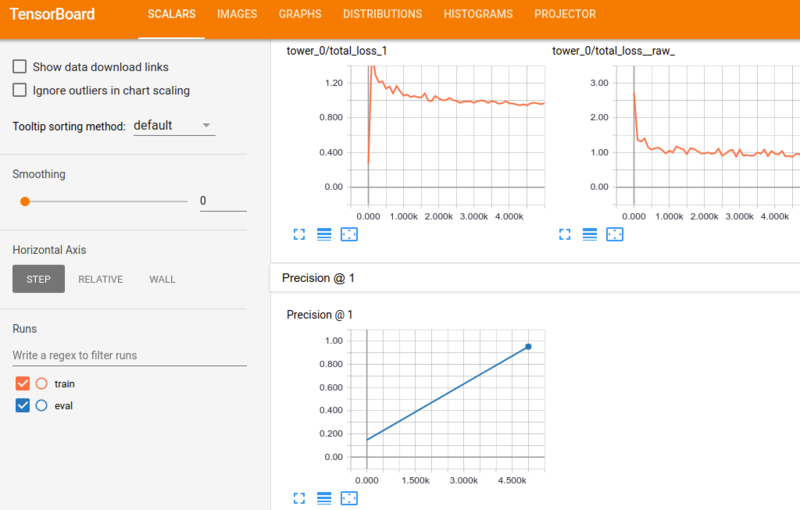 You need to add port 6006 to firewall rules for tensorflow0 to be able to see training progress in Tensorboard. 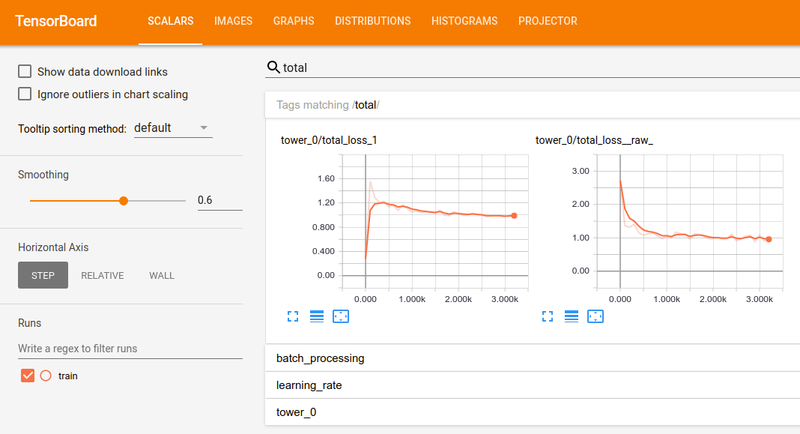 We will add network tag tensorboard to the tensorflow0 machine. This can be done only when the machine is switched off. Let us install python3 and Tensorflow on Tensorflow0 machine. We will start by updating Ubuntu. Now we are ready to install Tensorflow. We want to install GPU enabled version of Tensorflow, so let us check the hardware installed. But first, we will need to install CUDA. CUDA 9.0 is our recommendation for Ubuntu 16.04 and Tensorflow 1.9.0. We will use CUDA installation instructions from https://developer.nvidia.com/cuda-90-download-archive with a small modification – we will explicitly install 9.0, since there are newer versions. You should get a similar result as below. CUDNN is required for Tensorflow with GPU support. Go to developer.nvidia.com/rdp/cudnn-archive and download latest CUDNN 7 for CUDA 9.0. You need to be registered to download it, registration is free of charge. We recommend using general Linux package cuDNN v7.1.4 Library for Linux instead of packages prepared for Ubuntu. After downloading the archive, we will copy it to our server using Google Cloud command line tool gcloud. Back to tensorflow0. We will unpack the archive. 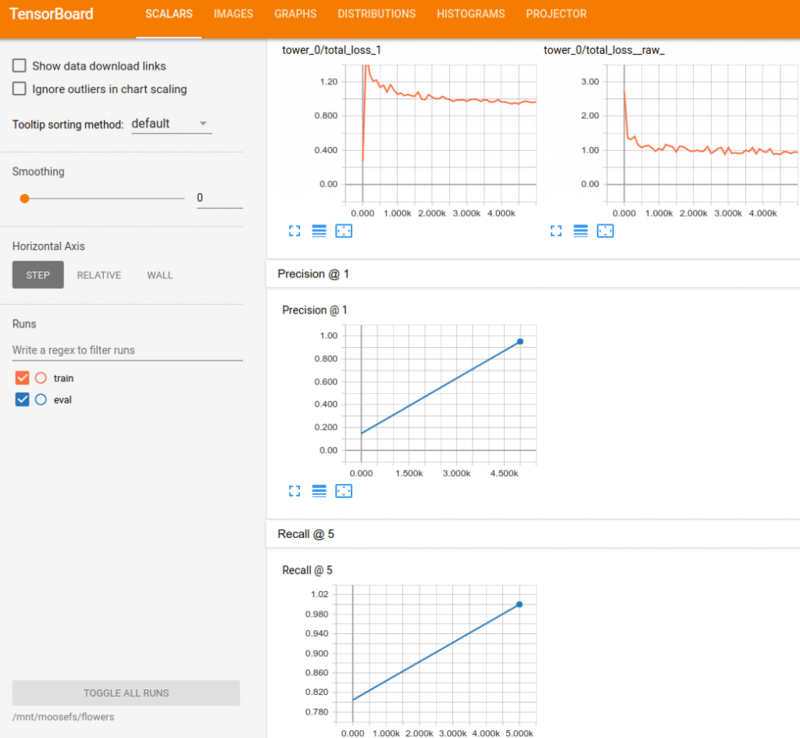 You can install Tensorflow using just one command thanks to Pip. physical_device_desc: "device: 0, name: Tesla K80, pci bus id: 0000:00:04.0, compute capability: 3.7"
We will download Tensorflow and Tensorflow models repositories from Github. Download Bazel from Github https://github.com/bazelbuild/bazel/releases. Choose the latest bazel_X.YY.Z-installer-linux-x86_64.sh package. Now we will download flowers dataset and got through inception v3 tutorial. # build the preprocessing script. 2018-08-09 09:56:40.812567: Finished writing all 3170 images in data set. drwxrwxr-x 3 karolmajek karolmajek 2.0M Aug 9 09:56 .
drwxrwxrwx 3 root       root       2.0M Aug 9 09:49 .. This will create a directory called inception-v3 which contains the following files. # use before this as this command will not build TensorFlow. Let us start fine-tuning the model! # Path to the downloaded Inception-v3 model. # Directory where to save the checkpoint and events files. Since we installed everything we can clone tensorflow0 machine. We will create a snapshot of the disk. 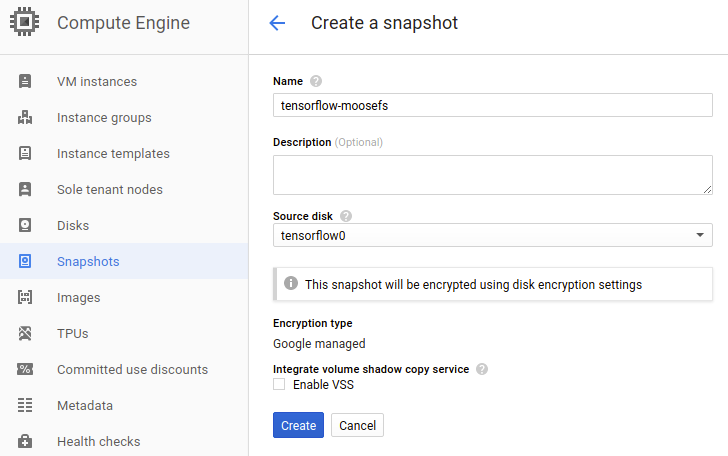 Now we can clone our instance tensorflow0 and use the snapshot as a disk. # Directory where to save the evaluation events files. # Evaluate the fine-tuned model on a hold-out of the flower data set. In this post, you have learned how to use MooseFS with Tensorflow to start evaluation on the other host and evaluate the model while training. Tensorflow is writing logs and saving models to MooseFS storage, so all of the files are available on both machines. You can also run another training simultanously and get more results with different parameters faster!